Love them or hate them Christmas films are a staple of the season but is this latest Netflix effort enough to leave you feeling jolly? When they accidentally catch a glimpse of Santa Claus (Kurt Russell), young Kate (Darby Camp) and Teddy’s (Judah Lewis) night takes an unexpected turn and they find themselves bonding again as brother and sister as they end up on a surprising adventure to save Christmas. If the premise of Kurt Russell as Santa Claus doesn’t fill your heart with joy then stop reading now and renounce any interest in the film, yes you heard correctly ‘Snake Plissken’ is Father Christmas! This isn’t the Santa we know and love though, he’s been given something of a 21st Century overhaul. Gone are the belly and fluffy red overcoat, we now have a trimmed down version sporting a red leather coat (thankfully still replete with a fur collar!) who is far too cool to be ‘ho-ho-hoing’ around town. 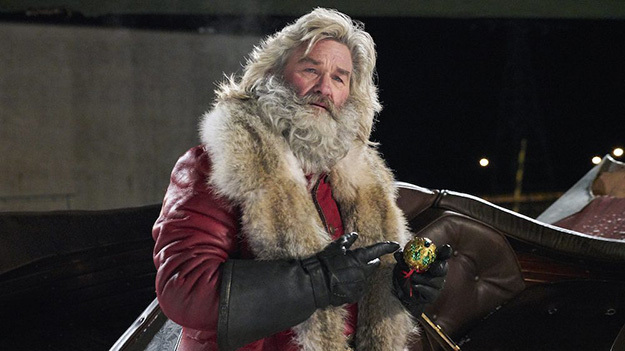 Believe it or not these slightly awkward attempts to modernise Mr Claus don’t sap the fun out of proceedings, Kurt Russell is having a ball here and relishing his role in the driving seat of the sleigh. A stand out moment is a musical number with Santa on vocals and the legendary Steve Van Zandt on guitar, if that doesn’t get you in a festive mood, then nothing will. Thankfully though that’s largely the extent of the changes, he still rides a sleigh pulled by the famous reindeer and his toys are still made by elves. 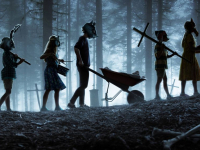 The effect-work is mostly decent, even if the CGI elves feel like a cheap attempt to cash in on the success of the Minions franchise and a couple of moments with the little critters veer too dark for the family friendly tone of the film. The kids’ performances are likeable enough and they do have some chemistry together, but their characters along with the backstory are largely forgettable, it’s the usual overly sentimental schmaltz that seems fitting at this time of year. 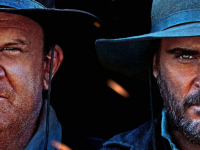 It doesn’t do the film any harm, but it does mean it’s unlikely to linger in your memory for any other reason than its A-list star.